Marketing chiropractic to medical doctors. Today we are going to break the tips, tactics, and strategies you can use to successfully market your practice to medical doctors in your community and make a massive impact on the health of your friends and neighbors. The opportunity to speak with, and get referrals from, medical doctors have never been better. And when I say medical doctors let me be clear. I mean all other health care professionals. It could be an MD, DO, midwife, doula, OB-GYN, athletic trainer, etc. The same process for reaching out to medical doctors can be used for reaching out to any type of healthcare provider. Let's break down a few important stats and facts. A recent research publication showcased that over 90% of primary care physicians have been asked about chiropractic by their patients. 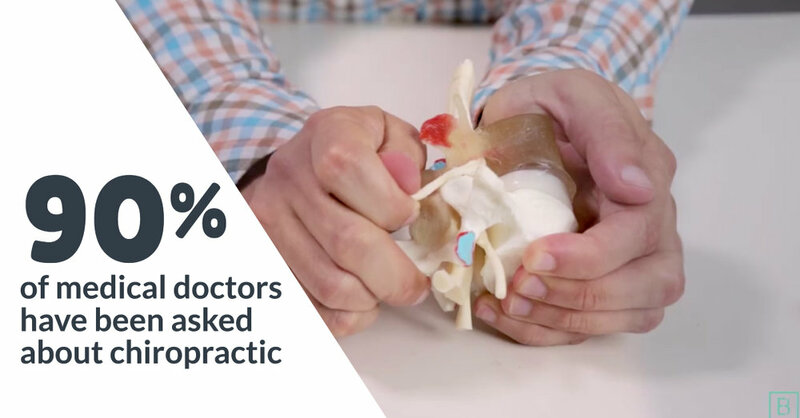 Yet only 11% of those individuals had made a formal referral to a chiropractor. Think about that gap! Over 90% of primary care doctors have been asked about chiropractic, yet only 11 percent have made a formal referral!! That gap is your opportunity. It's your opportunity to take a few simple steps and start bridging that gap with the other health care providers in your community. That's why am I so passionate about this. We know chiropractic utilization hovers around 12-15%, yet 90% of people will deal with muscular-skeletal complaints at some point in their life. Thankfully, less than 1% of these people have red flags. So that means almost everybody on planet earth is going to deal with a musculoskeletal complaint yet barely more than 10 percent are gonna come to see us! Research has consistently showcased chiropractic is very often the best option for care. And if somebody is not finding you and your practice it is very likely, they are going to go down a drastically different path. What is that "alternative" path? People with neck pain and with the back pain commonly take medications that don't work, move onto injections that are ineffective, and then they may undergo a surgical intervention which could have been avoided if they would have had exposure to your practice early on. The opportunity to save one person from that path is worth the work that it may take to bridge the gap with those physicians in your community. This is a long term strategy; it takes some time to build a relationships that can last your whole career. It's not like an advertisement that when you shut it off, and nobody sees it ever again. These relationships can evolve into hundreds, if not thousands, of patients being referred into your practice over a very long period. At nearly zero cost. That is why this is so crucially important. How to market chiropractic to medical doctors. Are you ready? Well, let's get started! There are three distinct categories of outreach. I call these the three legs of the referral stool. The three legs are case notes, research, and meetings. Each leg is critically important in supporting the others. Let's start with case notes. Case notes showcase that you are actively co-managing with these other health care providers. That helps to build social proof which is so important. I would imagine you work hard to have 80-90% of the people walking out of your office feeling a lot better than when they walked in. You need to show that off to the other health care providers in your community. And there's no better way to do that than a case notes. You should think of your case notes a patient-centric testimonial. So make sure you're sending case notes. The second leg of the stool is research. Research updates are a fantastic way to stay up to date with what's going on not only in our profession but also to keep the other healthcare providers in your community up to date on what's going on with healthcare at large. So what's the importance of research? Research does a couple different things. First, it gives you the opportunity to have a consistent message being placed in front of these other health care providers in a professional context. I think that you know that sending a medical doctor a coupon is probably not the best use of your time. So how do you reach out consistently and not aggravate them or become a nuisance? Research is a great way to do that. We recommend a cadence or a frequency of sending an update one time per month. One time per month gives you the opportunity to stay very consistent. It's a controllable marketing asset. That type of consistency is so important in bridging the gap and building that relationship. Case notes don't have the luxury of the same consistency. Case notes will ebb and flow. You can't control who walks in your front door, but you certainly can control that you get a research update. The third leg of the stool is following up with meetings. Nothing can build trust and rapport quicker than meeting another provider faces to face. Meetings are also the most challenging aspect of your outreach. They can take some time to book and will take consistently follow up with a lot of outbound calls. But, when executed properly they can really accelerate the process of relationships building. The best way to approach a meeting is to ask a lot of questions and discover the value proposition that you can bring to the table. 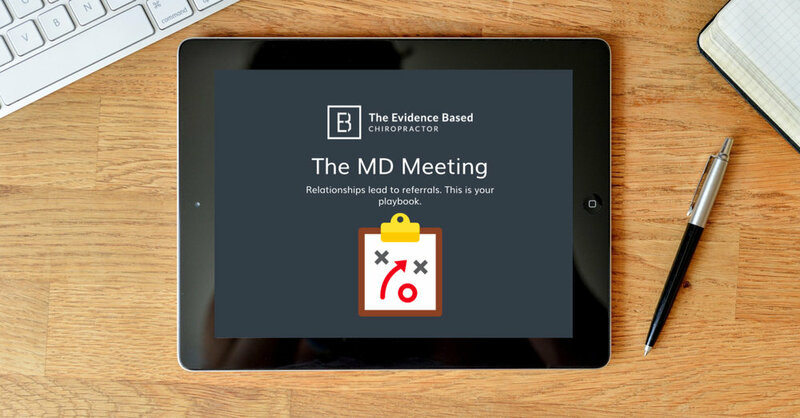 DOWNLOAD YOUR FREE MD MEETING GUIDE TO WALK THROUGH THE ENTIRE PROCESS! So there you have it. The three attributes the three legs of the stool that you should focus on immediately if you're looking to reach out and bridge the gap send that case notes out. Make sure that you're getting research updates out one time per month, set up some meetings, and start sending case notes. If you have any questions about any of this whatsoever, please leave a comment down below. At the evidence-based chiropractor, we have helped hundreds of chiropractors generate thousands of referrals by going through a systematic process of building relationships with other healthcare providers. And if that work has helped one person avoid unnecessary surgical interventions, then it's been worth the effort! Become a member of The Evidence Based Chiropractor and receive the complete solution to market your practice to medical professionals in your community.